Watch GAMES WORKSHOP Archives of Older Product Videos by TDmonthly. • An established company for over 30 years. • More than 3,800 independent toy, comic, game, and hobby shops around the world stock our products. THE HOBBY - Games Workshop is not just a game - it is a life long hobby. At the heart of the hobby are the millions of enthusiasts aged 12 and up who spend many of their waking hours collecting, creating, painting, building, and commanding beautifully painted armies on carefully prepared tabletop battlefields. A collection of models that hobbyists form over a period of time ranges greatly from small scouting forces to huge armies containing many hundreds of miniatures. Games Workshop products are not single purchase lines, which guarantees continuous sales all year round! 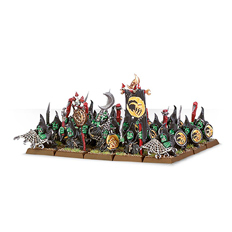 WHY CARRY GAMES WORKSHOP PRODUCT IN YOUR STORE? Do you want a customer group aged from 12 - 60+? Do you want a customer group that returns to your store time and time again? Do you want an easy to manage range of proven best selling products? Do you want your business to be advertised for free on both our website and best selling monthly magazine?